What’s likely to be the “next big thing?” What might be the most fertile areas for innovation? Where should countries and companies invest their limited research funds? What technology areas are a company’s competitors pursuing? To help answer those questions, researchers, policy-makers and R&D directors study patent maps, which provide a visual representation of where universities, companies and other organizations are protecting intellectual property produced by their research. But finding real trends in these maps can be difficult because categories with large numbers of patents — pharmaceuticals, for instance — are usually treated the same as areas with few patents. Now, a new patent mapping system, the Patent Overlay Mapping system, considers how patents cite one another may help researchers better understand the relationships between technologies — and how they may come together to spur disruptive new areas of innovation. Patent maps for major corporations can show where those firms plan to diversify, or conversely, where their technological weaknesses are. Looking at a nation’s patent map might also suggest areas where R&D should be expanded to support new areas of innovation, or to fill gaps that may hinder economic growth, he said. Innovation often occurs at the intersection of major technology sectors, noted Jan Youtie, director of policy research services in Georgia Tech’s Enterprise Innovation Institute. Studying the relationships between different areas can help suggest where the innovation is occurring and what technologies are fueling it. Patent maps can also show how certain disciplines evolve. The patent mapping research, which was supported by the National Science Foundation, will be described in a paper to be published in an upcoming issue of the Journal of the American Society for Information Science and Technology (JASIST); an open-access draft is available on arXiv. In addition to Youtie and Porter, the research was conducted by former Georgia Tech graduate student Luciano Kay, now a postdoctoral scholar at the Center for Nanotechnology in Society at the University of California Santa Barbara. The International Patent Classification (IPC) system is based on a hierarchy of eight top-level classes such as “human necessity” and “electricity.” Patent applications are further classified into 600 or so sub-classes beneath the top-level classes. Critics note that the IPC brings together technologies such as drugs and hats under the “human necessity” class — technologies that are not really closely related. The system also puts technologies that are closely related — pharmaceuticals and organic chemistry, for instance — into different classes. The new Patent Overlay Mapping system does away with this hierarchy, and instead considers the similarity between technologies by noting connections between patents — which ones are cited by other patents. 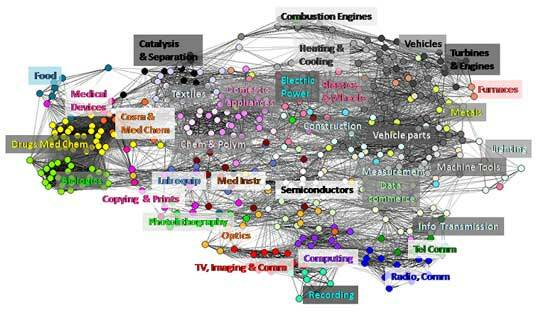 One surprise in the work was the interdisciplinary nature of many of the 35 patent factors the researchers identified. For instance, the classification “vehicles” included six of the eight sections defined by the IPC system. Only five of the 35 factors were confined to a single section, Youtie said. Because the researchers adopted a new classification system, other researchers wanting to follow their approach will have to use a thesaurus that translates existing IPC classes to the new system. That conversion system is available online. The research team also included Ismael Rafols of Universitat Politecnica de Valencia in Spain and Nils Newman of Intelligent Information Services Corp. This research was supported by the National Science Foundation (NSF) through the Center for Nanotechnology in Society at Arizona State University. The research was also undertaken in collaboration with the Center for Nanotechnology in Society, University of California Santa Barbara. The findings and observations contained in this paper are those of the authors and do not necessarily reflect the views of the NSF. For further information: Alan Porter, School of Industrial and Systems Engineering at Georgia Institute of Technology. This paper presents a new global patent map that represents all technological categories, and a method to locate patent data of individual organizations and technological fields on the global map. This overlay map technique may support competitive intelligence and policy decision-making. The global patent map is based on similarities in citing-to-cited relationships between categories of theInternational Patent Classification (IPC) of European Patent Office (EPO) patents from 2000 to 2006. This patent dataset, extracted from the PATSTAT database, includes 760,000 patent records in 466 IPC-based categories. We compare the global patent maps derived from this categorization to related efforts of other global patent maps. The paper overlays nanotechnology-related patenting activities of two companies and two different nanotechnology subfields on the global patent map. The exercise shows the potential of patent overlay maps to visualize technological areas and potentially support decision-making. Furthermore, this study shows that IPC categories that are similar to one another based on citing-to-cited patterns (and thus are close in the global patent map) are not necessarily in the same hierarchical IPC branch, thus revealing new relationships between technologies that are classified as pertaining to different (and sometimes distant) subject areas in the IPC scheme.